Jagadeesha Shetty, M.D. joined Center for Orthopaedics & Sports Medicine in July 1999. He has been a practicing Physiatrist since August 1998. He specializes in Electrodiagnosis, Chronic Pain Management and Non-Surgical Management of Musculoskeletal and Neuro-Muscular conditions. 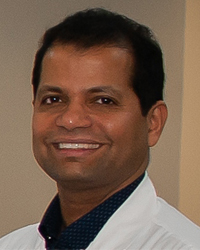 Dr. Shetty is also certified in wound care and Hyperbaric medicine. Dr. Shetty received his MD in 1986 from Vijaynagar Institute of Medical Science Bellary of Gulbarga University in India. He completed his rotating internship at Medical College Hospital, Bellary in July 1987. He underwent Orthpaedics Residency between 1987 to 1991 at Mysore Medical College and Father Muller’s Post Graduate Institute, Mangalore in India. He served as a senior registrar between August 1991 to August 1993 at City Hospital, Mangalore, India. He worked as a Orthopaedic Housestaff at Coney Island Hospital, Brooklyn, NY in June 1994. Dr. Shetty completed one year of General Surgery Residency at Maimonides Medical Center, Brooklyn, NY from July 1994 to June 1995. In 1998 he completed a three year of Physical Medicine and Rehabilitation Residency at Kingsbrook Jewish Medical Center, Brooklyn, NY. He had his Cardiac Rehab training at Rusk Institute, New York, NY and Sports Medicine at Lenox Hill Hospital, New York, NY. Dr. Shetty is Certified by American Board of Physical Medicine and Rehabilitation. He has subspecialty Board Certification in pain medicine. He is the Medical Director of the Rehab Care Center at Indiana Regional Medical Center. He is a member of American Medical Association, Pennsylvania Medicial Society and American Academy of Physical Medicine and Rehabilitation. You can view a pdf of Dr. Shetty’s Curriculum Vitae here.